Gametocyte/Gamete Normal production of gametocytes and gametes. A punctate GFP-fluorescence pattern that appeared to be restricted to the cytoplasm of female gametocytes was observed in live and fixed cells after immunofluorescence assay (IFA) analysis with antibodies to GFP. The mutant showed wild-type fertilization rates and zygote/ookinete production. Fertilization and ookinete The mutant showed wild-type fertilization rates and zygote/ookinete production. The mutant expresses a c-terminal GFP-tagged DOZI (protein development of zygote inhibited; ATP-dependent RNA helicase, putative). DOZI is an RNA helicase that is highly up-regulated in female gametocytes and shows high sequence homology to the DDX6 family of RNA helicases. It contains domains involved in RNA-binding and RNA-unwinding activity. In other eukaryotes the DDX6 family of DEAD-box RNA helicases is tightly linked both to storage of mRNAs encoding proteins associated with progression through meiosis into translationally silent mRNPs and with the transport of mRNA to degradation centers in the cell (P-bodies). These helicases are found in organisms as diverse as yeast (e.g., Dhh1p) and humans (e.g., RCK/p54). The phenotype analysis of a mutant lacking expression of DOZI (RMgm-100) indicate that DOZI has a central role in the silencing and maintenance of steady-state levels of a population of gametocyte-specific transcripts. The loss of DOZI severely affected the capacity of the parasite to store and stabilize a discrete subset of mRNAs in the female gametocyte, resulting in a failure to synthesize specific proteins and to complete normal zygote development. Translational repression of transcripts encoding these proteins in Plasmodium may function to specifically regulate gene expression during meiosis in the zygote. The phenotype analyses demonstrate normal fertilisation and zygote/ookinete development indicating that the function of DOZI is not affected by the GFP-tag (see RMgm-100 for the phenotype of a mutant lacking expression of DOZI). A punctate GFP-fluorescence pattern that appeared to be restricted to the cytoplasm of female gametocytes was observed. Fluorescence in situ hybridization (FISH) analysis of the localization of translationally repressed transcripts of genes encoding ookinete surface proteins P25 and P28, showed also a punctate localization pattern comparable to that of DOZI-GFP, indicating that the repressed transcripts and DOZI are distributed similarly in the cytoplasm. Immunoprecipitations of the DOZI::GFP fusion protein from gametocyte lysates have been made with monoclonal anti-GFP antibodies. The eluates have been analyzed for DOZI protein and transcript content, showing the presence of (known) translational repressed transcripts. This mutant has also been used for analysis of the protein content by LC-MS/MS mass-spectrometry of imuunoprecipitations of the DOZI::GFP fusion protein from gametocyte lysates (see PubMed, PMID number 20169188). This analysis identified a number of proteins that show homology to proteins found in metazoan mRNP granules involved in translational repression of mRNAs indication the presence of messenger ribonucleoprotein (mRNP) bodies in gametocytes with homology to metazoan mRNP granules/P-bodies (see also mutant RMgm-358 for characterization of another protein, CITH; CAR-I/Trailer Hitch Homolog, that is present in the mRNPs of gametocytes). 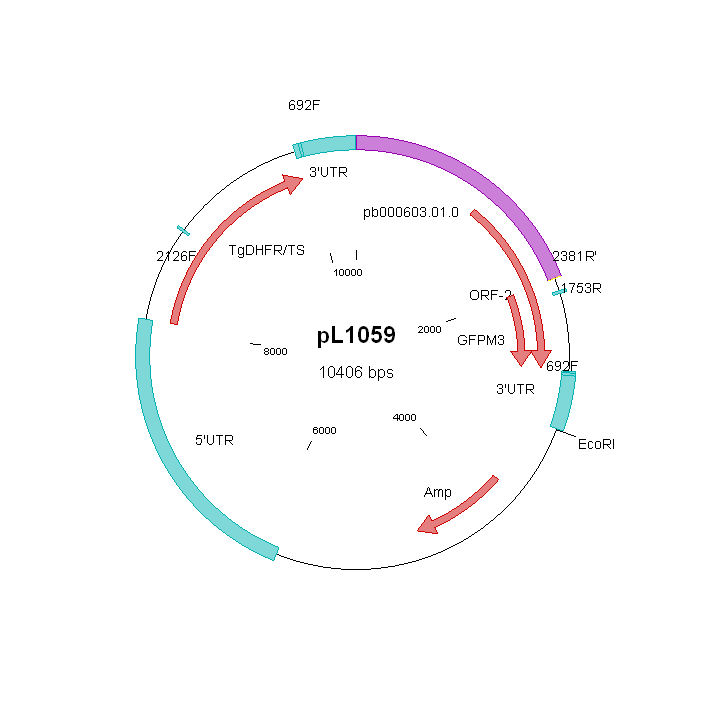 RMgm-100: A mutant lacking expression of DOZI. RMgm-361: A mutant which lacks expression of DOZI and expresses GFP under control of a male and RFP under control of a female gametocyte specific promoter. Additional remarks genetic modification C-terminal GFP-tagging of DOZI was performed using a construct that integrates through single cross-over homologous recombination into the pbdozi-locus and contains the tgdhfr/ts selectable marker. The disadvantage of using an insertion construct is that the construct can be removed from the genome, thereby restoring the wild type genotype. The primers as shown below were used to amplify the 2153 bps targeting region of pbdozi.